December » 2008 » Harrumph! At the end of her life, my mother found that heart medicines ruined bittersweet chocolate for her. A prime oral and olfactory delight became very unpleasant. We were sad together for her. She waited over a year to tell me. She wanted to be positive, to see that the condition remained, and most of all, not to have me share in that sadness. There were three of us growing up, her, my sister and I. Though we had a large extended family, we moved often and our trio was the constant. We rather liked each other and had a lot of overlap — including the love, even adoration, of chocolate. Here in Beantown, we think of the cocao bean from which cocoa and chocolate come. Frankly, you can have every one of those mushy and insipid potted brown beans many associate with Boston with my blessings. Keep your hands off my dark, unsweetened or bittersweet chocolate though. My mother, Wanda, was not self-indulgent often enough. She worked very hard, she raised two kids solo, and she volunteered at church and elsewhere literally to the day she dropped dead. However, a great piece of chocolate was worthy of comment and deep enjoyment. As surely as a Zen master might, she taught me delayed gratification and focused satisfaction. She could sit in a sort of trance of patient greed, nibbling a sliver of great dark chocolate, allowing it to dissolve, rampaging through her oral and nasal cavities. While others might curl up with a bottle of booze, getting less alert by the moment, she preferred an intensifying pleasure. My sister and I learned by observation and have likewise benefited. It is a gift that keeps on enchanting. Growing up, our Christmas stockings had birthright and boomer-appropriate treats, like the necessity of Life Savers Story Books. There was always a bar of good chocolate for later. Also, the older adults invariably gave each other — and by default the room of us —massive, compartmentalized chocolate samplers. A scan of the brown tones and another of the legend on the lid gave the real chocolate fiends the location of the goodies. We’d go for a chocolate filled dark chocolate, none of those cloying strawberry mess or cream cherry fillings distracting from the real thing. So now Wanda is in ashes, half of them in an inlaid box on an office bookcase top. I do my part still to recall her enjoyment of the good stuff. My stocking too contains several bars of meditation-quality chocolate. Of course, I give as good as I get and continue the tradition. I understand there are some who do not like chocolate and a few who find it makes them sick. I would not weep for them. It was for my mother who remembered what used to bring such simple, but deep pleasure, that I reserved my empathy. 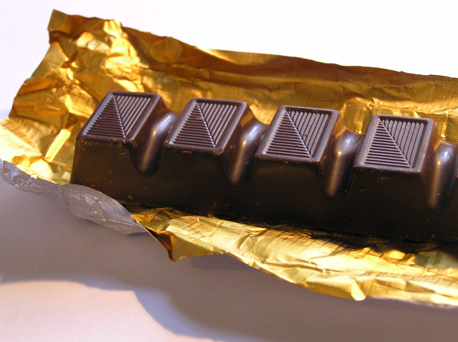 A Christmas without chocolate…that’s a tragedy. I’m not sure which curse is appropriate. The snowplow guy mentioned before outdid himself overnight. He needs attention from Nemesis. It took two of us in concert for over an hour with serious tools to override him. Although we shoveled several times yesterday — including doing the nice thing for the neighbor who can’t on his own — and wrapped up around six. Our walks were merely dusted and both cars were totally clear down to the asphalt and concrete all around. 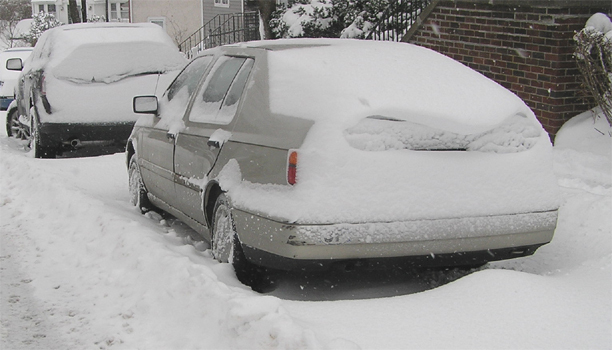 The plow demon came sometime at night and must have pushed the barrels of snow, ice and slush a considerable distance to build a wall against both car and van. It was as solid as cinder blocks and two times as high. Fortunately, I keep a wood maul in the basement for splitting logs. Swung wide or tamped from high repeatedly, it was tough enough to break the surface of the ice and give the shovels a chance at scooping. This was slow and required repeated applications of the hunk o’ steel. As previously, the other side of the street got no plow leavings. As previously, we were on the side of the street where people are supposed to park according to the city. Even though the snow emergency was officially over, we thought the punishment for us might stop. Instead, we are left wondering whether plowboy is so stupid that he doesn’t realize that continuing to pile up snow and ice against cars will strand them, or is so blissed by his joy of machinery that he doesn’t think of it, or is a cackling nasty. The glimpses I’ve caught of him reveal nothing other than he looks disturbingly like Ernest Borgnine. We solved our problem this morning and am sorer for doing so. We were left wondering what people without lumberjack tools would do to escape. Now, I can think of Nemesis. What is the appropriate curse for such repetitive evil? There is no Tick to reprimand him. Yet, justice would demand that he be likewise stranded and forced to deal with it by hand. We can curse him to be on a ski trip and get snowplowed in the driveway on the 11-degree morning when he has to leave to return to work. No one would be there to help, the drive entrance would have many feet high and wide of solid ice and snow, and he a shovel and a pressing need to use it. I’d even relax the curse enough to let him find a maul in the garage. Those laugh a minute, no, five laughs per minute, Boston snowplow guys clearly make their job fun. When they aren’t playing Hide the Hydrant, they make the most of what would otherwise be tedious work. Here in our very unbusy Woodbourne, we could be more boring…if there weren’t little jokes. 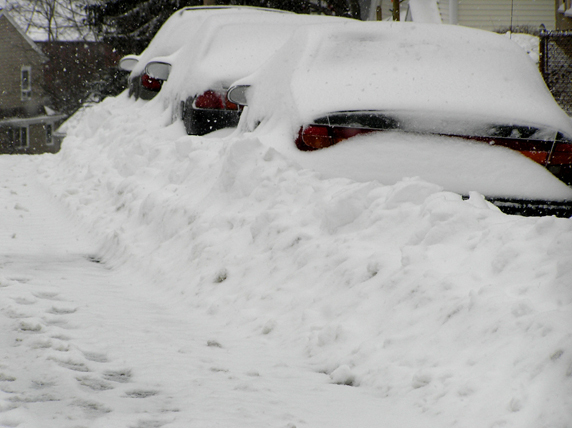 A good running routine seem to be burying cars on one side of the street — the side the city says to park on during a snow emergency. These pix show the punchline. We are supposed to park on even-numbered sides of our streets. In the image on the left, after the plow swipes the odd side has maybe five inches of unpacked snow. On the right, cars on the legal side of the street are dammed in nearly three feet of packed snow and ice mashed against the cars up to two and one half feet wide. Ha ha ha ha. That’ll teach them to park where we told them. Ha ha. We hardly qualify as secondary streets. It’s all single-family houses. There are many more on-street spaces than cars. We don’t even rate neighborhood parking signs or stickers. We’re too far from commuter rail and subway lines to tempt non-residents. In theory, the plowboys may be unaware of where cars are supposed to park (unlikely, eh?). Perhaps they need a remedial lesson on how to know whether a house number is odd or even (the stereotype might support that for public school grads). These pix were on a long, single-block street. The driver would have to drive West to be nice to the cars parked on the even side of the street. That never happens. It would ruin the joke. I’ve caught three babies, including the last one I delivered unaided. All three were midwife/birthing center deliveries. Nearly 30 years ago, my wife and I figured that would be the future for most Americans. Drugged women in stirrups, slicing perinea, and lifting fetuses out through cesareans were the old, post-WWII fad, eh? Well, no, and women (and couples) almost lost the only birthing center around Boston. After howls leading to a campaign to keep the one at Beverly Hospital, the board there agreed that it could stay open…at least for a bit. I have three sons (cue the theme) and am a big believer in midwives. That’s cost center number two above at not quite a year as he got his first hair cut. He was born in a bed in the house on that campus. Even in 1990, they didn’t make it easy. We had belonged to the Harvard Community Health Center for 11 years, back when co-pays were as low as $2 and they actually practiced preventative medicine. Yet, for a midwife delivery, we had to drive from the very bottom of Jamaica Plain to Beverly — 40 minutes with no traffic and much longer typically. We’d had our first in 1979 in Manhattan. The original Maternity Center, started in 1917, was in a textile-magnate’s former mansion. It was just a home birth, if you had filthy rich parents. Originally the prototype of safe, affordable birthing for working-class women, by then middle-class folk had caught on to better-than-spinal-block options. The midwife thing still has not-so-secret conflicts. Understandably, OBs would prefer a monopoly. Even though there’s lots of data showing that here and in other countries, in birthing centers and at home, licensed midwife delivery is safer than in hospitals, many OBs and hospital types will say otherwise. Anyone who’s gone through the midwife process can tell you why it’s better. Particularly with cost center one, we went through booty camp. There were 10 two to three-hour classes, everything from nutrition to gruesome birth movies to diapering. We met regularly with the midwives and occasionally with the backup doctor. It was blood pressure and blood content tests, belly palpation and listening and on and on. My wife had many more visits, much longer and more detailed attention, and greater health at delivery than non-midwifery women. High-risk and even slightly elevated moms-to-be were fixed or screened out. They would not go into labor at the center with iffy medical conditions. Of course, their deliveries were safer than the slapdash results from typical hurried OBs or nurses. We were amused early on when the backup OB told us to listen to the midwives about such matters are the real due date. He said doctors use a chart from estimated conception. The midwives listened through a tube or stethoscope and well as feeling the action. He said doctors guessed but midwives knew. My wife delivered that one a day before they had estimated and almost two weeks after the doctor’s date chart had. With cost center two, we relatively raced to Beverly at a non-rush hour. As with the first, we were on the street about 12 hours after the birth, once the center and a drop-in doc okayed the new product. That at least is becoming more the norm for hospital deliveries too and is a damned sight better bonding than immobilizing the mom, isolating the dad and bringing the baby around for feeding every so often. Three years later for cost center three, Beth Israel had added a birthing center (since dropped). It was only a couple of miles away. We would not have made Beverly for sure. From my wife’s first pang, it was under 40 minutes to delivery. The midwives were casually washing and chatting, while I realized the urgency and already had my gloves on. I caught him while they were still across the room. 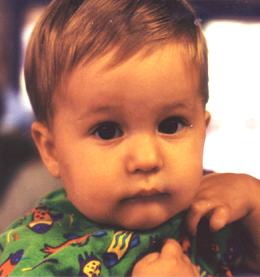 As a coda to the third birth, note that he was the only one born in a hospital, even if without doctors and in a birthing center. Moreover, Beth Israel is a teaching hospital for good and ill. In this case, the doctor who checked him out decided his heart rate was slow and ordered him into the neonatal ICU for the interns to tinker with. My wife was very unhappy not to be home with her baby…and to see him in a plastic box with needles and tubes running from his neonatal hand. A day and change later, our HCHP doctor had a minor fit when he arrived. He pronounced him very healthy, declared he likely would be a good athlete with such a heart and sent us all home. Beware hospitals with med school professors. Otherwise, I hope women get the choice in the Boston area. I know that many hospitals use the excuse that birthing centers have been hit with unreasonable insurance hikes, keeping pace with OBs and other doctors. I don’t see the solution as dumping birthing centers. Beating up on the insurance companies to make them reasonable is better for everyone concerned. By the bye, there is a website and related Facebook page for the campaign for the center in Beverly. The signage elves came this morning. Six days after requesting a constituent service from my city councilor, it was done. We had driving rain for two days and bitter cold for several others. Yet, my little miracle happened. I am new to this and am impressed by John Tobin and Anna Sylvester’s work. I might conclude that he gets things done. I might also conclude that I should occasionally ask for the easily achievable. Probably both are right. I am wont here and on other blogs to speak for high-minded and expansive aims, for righting big wrongs. I think a stop-sign replacement holds a lesson for me. A couple of years ago, some driver sheared the stop sign post. Rather than do the right thing, the city crew put the old sign on the street-sign pole at Bourne and Walk Hill Streets. The stop sign was then obscured by the fence until Northbound drivers on busy Bourne Street were literally on it. They stopped in the intersection, blocking it and stranding left turning cars and bikes facing Walk Hill traffic bearing on them. Seeing Councilor Tobin for his coffee-shop hours, I asked on the way out what city agency I should ask for a replacement. He said he and his aide would do it. I guess they came from good stock too. Sylvester sent me email saying she had requested a replacement post back 15 feet from Walk Hill were the old one was. She also mailed a hand-written note saying it was in the works. Also Councilor Tobin and I swapped a couple of short emails. Seeing local cynics, particularly in the Herald, I wondered whether this would become an amusing avocation. I planned to report on the progress and when the crew finally showed to photograph them and see how long it took. Well, that’s not going to happen. Howie Carr or those other old rich kids masquerading as working-class champions aside, I rolled up Bourne this morning to see the new sign in the old place. I watched five motor vehicles. They all did the typical Boston stop — that is rolling half a length past the stop-sign before stopping. However, because the sign is a car-length back from Walk Hill, they weren’t actually blocking people turning and were safer in spite of themselves. I had asked for a stop line, which Sylvester said she’d request. I’m sure that would be part of a batch job when a crew is out re-striping around here next. That would be another visual cue to stop short of where moms with strollers walk and old men such as I bike. In concert, the sign is now visible two blocks away, no longer hidden by the privacy fence. I view this like when I taught swimming. We learned to tell beginners to keep their legs straight in the flutter kick. The best kick is really slightly bent legged, but say that and most people would practically put their heels in the middle of their backs. It’s better to use a little trick and end up with the right thing. Likewise, a stop sign 15 feet before the street gives people the sense they are on the edge in half-way passing the sign when they are where you want them. So, there’s no tale of a negligent Councilor. There are no absentee public works employees. There’s nothing but good to report. Right Present for a Dead Writer? Oh what, oh what do you get the dead for Christmas or Hanukkah? 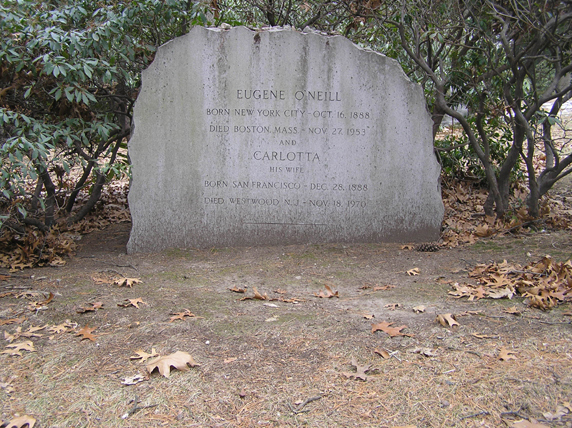 Our Forest Hills is not quite Paris’ Père-Lachaise cemetery (cimetière de l’Est), where admirers leave booze, lingerie and more on the stones of singers and actors. Being Boston, we do have our own low-tone versions though. Two I stop by on occasion are poet e.e. cummings (EDWARD ESTLIN CUMMINGS on the stone) and playwright Eugene O’Neill. Clearly, others have preceded me. Pix Tricks: Click a thumbnail for a larger view. If this opens in the same windows, use your browser back button to return. Finder Tips: Their corpses rot less than 100 yard away. Directions to the Cummings site are here. 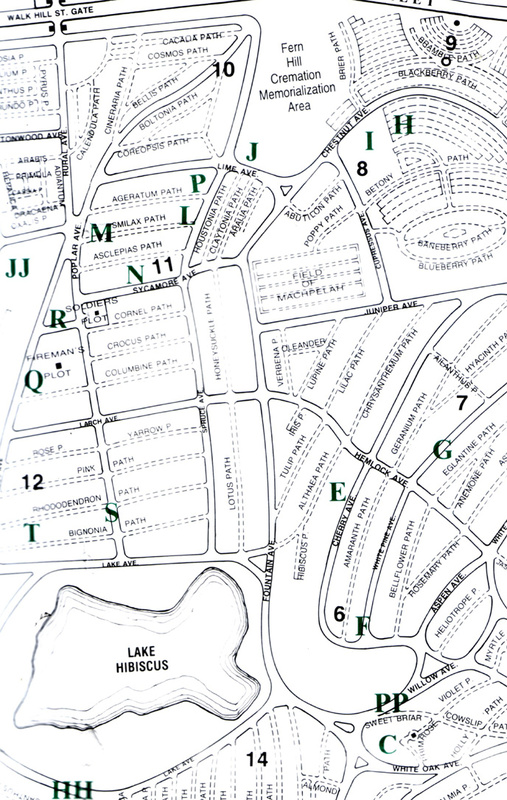 The O’Neill plot is off Chestnut Avenue at the bottom of the H on the same map fragment.Tucked in rhododendrons, the large, erose stone is not easily visible. Look instead for the SEARS/ROBBINS/LOREY marker. Eugene and Carlotta lie beyond that. Cummings is the sentimental favorite here. O’Neill was clearly brighter and the better literary artist, if far inferior in tapping into public themes as well as promoting himself. His work was almost entirely brilliant, but far less accessible to the love-rapt and to the melancholic. Snark aside, I have always enjoyed Cummings and can quote quite a few of his lines. In addition, I find him almost Japanese and haiku-like in his seasonal and nature references. In a few often odd but not strained words, he can link emotion and environment. Cummings is buried between his mum and Marion Morehouse, who may have been his third wife. His quickie Mexican divorce from Mrs. #2 was not U.S. legal when he and the model wed. It terms of relative immortality, it pays to be the last spouse. By the bye, UUs claim everyone who tilts a head our way more than once. Cummings did more than that. Like bus and subway riders, Cummings and O’Neill pilgrims differ. In the case of those who visit the graves, they bring and leave disparate objects. I have seen and heard folk reading Cummings poetry at his grave, often giggling and often being, well, young. Scholarly types are more likely to visit the playwright, and do so less frequently. It’s obvious that many more visit the poet’s site. While the grounds crew does remove gifts/debris, they are not janitors. Expect to see coins, beads, tiny river stones and pretty good sized rocks. This week, a sad, wilted, tiny poinsettia was there; it plainly did not care for the cold. On either side were two copied Cummings poems (into the strenuous briefness), each decorated with simplistic flower drawings and held ephemerally by a rock. The offerings too differ for these masters. Those on O’Neill’s marker is similar to the Holocaust memorial downtown. The typical artifact is a respectful stone, a traditional and somber mark of respect. There are no gifts around the stone, only on top. 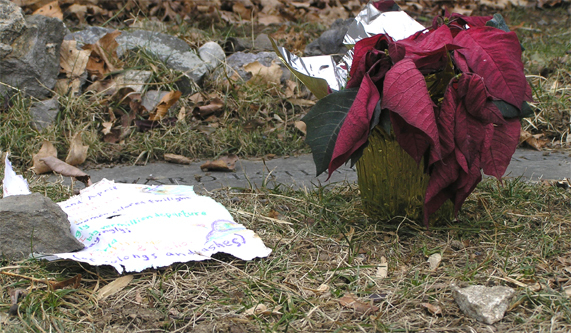 Otherwise, at this cemetery there aren’t many notables with gifts, even at Christmas. For example, Albert Augustus Pope’s crypt is there. He created the usable bike and the industry, but I never see pedals left for him. He’s a stumble away from restaurateur Jacob Wirth, but that tomb doesn’t have leavings of beer steins. Instead, if you travel down north a couple hundred yards to the new section near Morton Street, there’s offerings galore. The Asian-American (and some Italian-American and African-American) stones have lots of goodies. Chinese descendants particularly get paper representing heaven money and many such traditional treasures. Personal notes and artifacts appear, at least temporarily, on others. In death everyone can be famous, at least to those who already know them. This is a test of your Elected Official Effectiveness System. 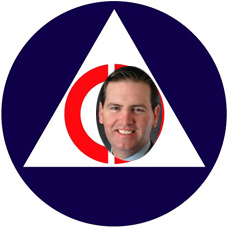 Will Boston City Councilor John Tobin (WR/JP) make my intersection safe? If so, how quickly? What’s a reasonable period for replacing a sheared stop-sign post — a season, a month, a week? I didn’t really mean to put him on the spot. That came as a throwaway question at the end of a session with him at JP Licks. When I asked where in City Hall I’d go to ask for this, he said “We’ll do that.” In that case, joining him in the booth was Legislative Aide Anna Sylvester, to make a we. Tobin is high-energy, deep integrity. I expect him to do what he says. If your city councilor (or equivalent where you vote) holds regular open office hours, go from time to time. If your officials don’t, ask them why and point to folk like John Tobin as examples. Almost every month, my guy has two open sessions. One is at his West Roxbury office and the other floats from coffee shop or ice-cream joint, generally in JP. That way, he is close to both neighborhoods in his district. He announces them in the local weeklies as well as on his personal website. By the bye, you can also trundle down to his City Hall office, nominally from 9 a.m. to 5 p.m., five days, but call first because he may be doing Council biz elsewhere. Pix Tricks: Click on a thumbnail for a larger view. If this opens in the same browser window, use the browser back button to return. He may or may not get takers at a session, but he’s there.When you’re there, you’re the only person he sees in front of him. That’s the right kind of intense. This morning, there were two of us, with an elderly woman as well as I. I would gladly have shared the booth with her, but she waited until I finished. Perhaps she came with a specific request she wanted to deliver privately. One of these open meetings a year ago is where I chatted him up and got him to come onto our Left Ahead! podcast. The full one of that is here and the short version concentrating on his term-limits for Boston officials is here. We had a free-ranging chat today because I didn’t come with any planned business. We touched on the status of his citywide Wi-Fi proposal (he’s still pushing and sees it as an equalizer for poor families and kids), arrested-for-corruption Councilor Chuck Turner (they got off to a bad start, but Turner ended up supporting his run for Council president later, and Tobin wants Turner to have his say/day in court), and why he seems to have a ton more ideas and proposals than the other councilors (he modestly claims most come directly from activist JP residents). When I finally realized the woman had sneaked into the booth behind me and was waiting for her audience, I fired off the stop sign question to wrap up. He promised and Sylvester took the intersection info. I’ll update here. The stop sign at Bourne and Walk Hill Streets is on the street-sign pole. The stop-sign post had been sheared and some easy-way-out crew moved the sign. 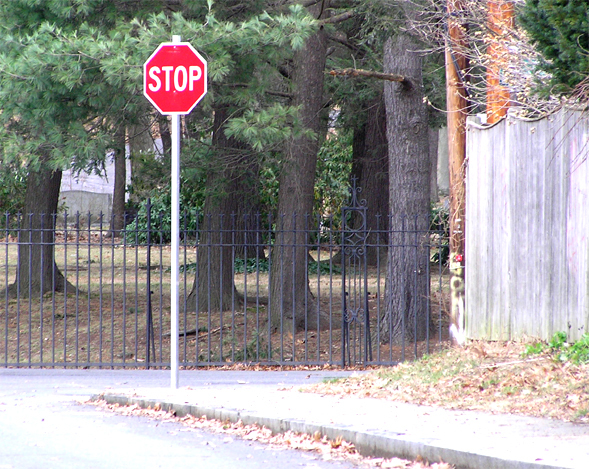 The adjacent property fence obscures the sign until a north-bound vehicle is nearly at Walk Hill. Cars race up Bourne and with typical Boston manners, stop just past the sign. That puts the front several feet of the vehicle into Walk Hill. Any vehicle, but particularly bicycles, turning left onto Bourne, often find themselves stranded in mid turn by a car or truck blocking the intersection. 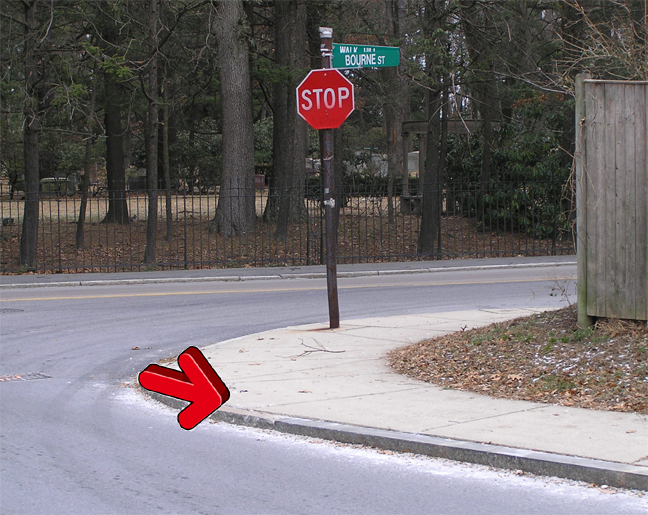 If the stop sign was where it belonged, the tendency for drivers to go beyond it to stop would put them a safe distance back. The car in the image to the left is still moving. It is in the typical place at the intersection, with bumper into Walk Hill and blocking turning vehicles. The suddenness of the stops here are particularly dangerous for pedestrians and cyclists simultaneously approaching the corner. Both Walk Hill and Bourne are very busy, so such coincidence is common. More than once, I have almost been hit on my bike and stopped to point out the problem to the drivers. I know what to expect and am always cautious here, in car or on bike. Two of those times, homemaker types in newish SUVs have sworn at me in very coarse terms. The out-of-my-way-Jack and I’m-important-no-one-else-is types need their visual cues to act decently. It will be far easier to install a new pole in the old place than to teach locals what their parents didn’t model or say. I’ll update this when the mini-drama plays out. O.J. Simpson lied to me directly. Come to think of it, that’s not much of a distinction. It would be hard to count how many could say the same. Mine was about 30 years ago, heading into his last season as a running back with the Buffalo Bills. He lied about about his football career. As a newspaper reporter and editor, I knew lots of convicted criminals. Some were sources, on or off record, or in some cases part of a package, such as interviewing maximum security inmates. In my new life as a magazine editor, I got to meet higher-class liars and crooks. Some of them would never be convicted of anything. Regular readers here will remember another, Ed Mattar. I did a fat old book with him that McGraw-Hill published. He was a high-level fraudster who leaped to his death rather than go to prison. Simpson I only interviewed one time. It was about his non-football shilling of products. There was an elegant symmetry though. The product was orange juice. Even then I wondered whether the personal story he told was real, embellished or another lie. You can see a clip from the period on YouTube of him pushing TreeSweet juice. Part of the coverage was to talk to vendors as well as store folk. It worked doubly well if there was an angle the stores could pitch to increase traffic. Thus, the great back, Orenthal James Simpson, was fit to quote. When I heard he’d stop by the National Association of Convenience Stores annual conference and exhibit, I asked for an interview. Honestly, we all knew that other than O.J. getting paid to pitch O.J., we didn’t have much intersection. I have to say he was charming. He clearly knew he was good looking, famous and oh so smooth. He had the smiling and affinity things nailed. Yet, even if he were being honest, he was hard to believe. The obvious lie came after the real business of juice and such. Then I just had to ask whether he would blow off the Bills after the 1977 season. He looked at me very sincerely and totally incredibly proclaimed he intended to spend the rest of his career in Buffalo. Nearly everyone knew he hated it there and was looking hard to get to someplace warm, ideally California. As it turns out, he got hurt and the Bills were happy to trade him to the 49ers when he asked next. He spent his last two years playing in San Francisco. For the juice stuff, I’m not sure. His nickname, some say, just comes from his initials. He told me that his mother, Eunice, worked in a hospital (true). He said she brought home leftover cans of O.J. that would have gotten tossed otherwise. He loved it, asked for it constantly, and got his name from that affection. He was pushing TreeSweet juice. That was independent, later became part of Kraft Foods, and seems to have disappeared when Adam & Eve (the fruit juice folk, not the sexual devices ones) bought the brand. They apparently folded it into their other lines. O.J. 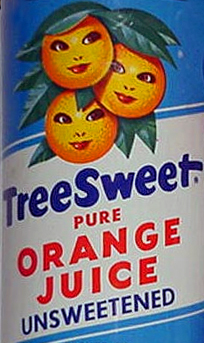 said that TreeSweet was the O.J. he grew up craving. Thus, he went on, he was delighted to become their spokesman. As Jerri Blank would say in Strangers with Candy, “Then we’ll never know.”It’s really not important whether Simpson told the truth, whole truth and nothing but about O.J. I suspect it wasn’t necessarily TreeSweet he drank and that the nickname came from his initials, later reinforced with his enjoyment of the beverage. I also suspect that his social skills and conversational lubrication made him prone to telling good stories. People like a polished tale, more than most of us demand rigid honesty. Simpson heading off to prison did recall those few minutes. That in turn recalls the peril of reporters. If it had been important my readers and me whether he was staying with the Bills or what O.J. O.J. had in the fridge as a child, I would have pursued those bits. They weren’t. I didn’t and now I’ll never know. On Wednesday, the 17th, we get Nicole Freedman on the Left Ahead! podcast. She’s Boston’s bike czar, with the unenviable task of changing us from bike unfriendly. It’s good that Mayor Tom Menino got behind cycling. It’s great that he named such a driven person to head this effort. She’s taken the best from Cambridge’s solid cycling programs, as she described at the Moving Together conference two months ago. There was no doubt she was starting from way behind, but she developed a master plan and is attacking it like it was a race. She’ll talk to us about some of the things we’ve seen. That includes bike lanes whenever a street gets restriped or resurfaced. Not only does that increase cyclist safety, but it also gets drivers to start thinking of bikes and sharing the road. She’s targeted some easy efforts — figuring out where bike racks will help and putting them there, some harder ones — cages at major T stops and bus bike racks on crosstown routes, and will tell us what her most serious challenges are. Maybe you’re like me who bikes whenever you can. Maybe you’d bike more if you felt safer doing it. Maybe you wonder why anyone would even think of biking in Boston. Regardless, Freedman is worth a listen. You can hear the live stream 12/17 at 2:30 p.m. or check Left Ahead! for the podcast later. Folksinger and activist Odetta died, apparently of heart failure, at 77. She was here and seeming frail in July. The Globe is running a personalized obit by James Reed. Do get past his self-absorption and finish the whole thing. For those who don’t know her music and life work, there’s plenty. The New York Times has a full obit with details and analysis. It also has an embedded 20-minute clip with music and interview of the older Odetta. Writing of, if you don’t know her music, that at least remains. I recommend starting with an old, but complete one, The Essential Odetta. You are currently browsing the Harrumph! blog archives for December, 2008.